There are several operators in the small community of Marahau, who offer guided kayak tours in the Abel Tasman National Park. 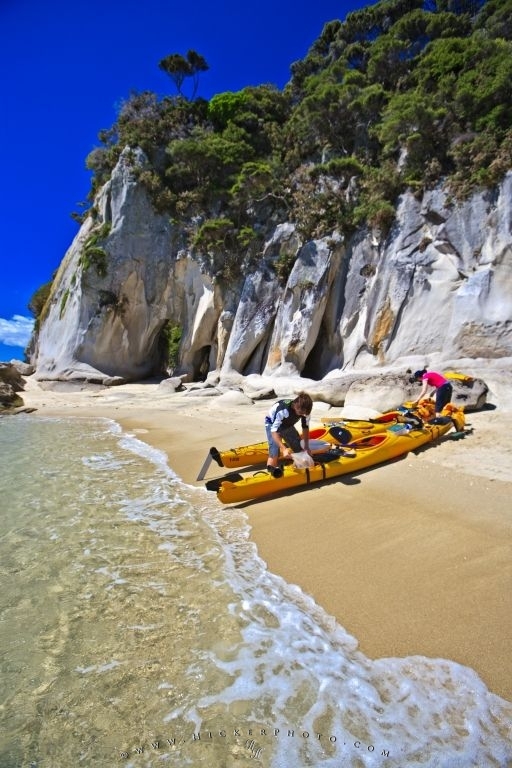 One of the most beautiful areas in New Zealand for a guided kayak tour is the Abel Tasman National Park on the South Island. Most operators offer guided kayak tours for anything from half or full day to multiple days, even simple kayak rentals. Kayakers on the beach at Arch Point, Abel Tasman National Park, Tasman District, South Island, New Zealand. Model Released. Photo of a couple taking a break during a guided kayak tour in Abel Tasman National Park. Pictures from photo gallery "Abel Tasman National Park"
This picture is part of the photo album "Abel Tasman National Park" - there are more beautiful images waiting for you.